Although 2018 Toyota Sienna sees the new Honda Odyssey as the major competitor, we can’t forget about other vehicles. All of them have advantages and lacks. So, we will continue our analysis to make it easier to buyers when they are after the best minivan. The next vehicle we will compare to Sienna is 2018 Chrysler Pacifica. We are considering a 2018 Sienna as probably the best minivan in the market, but other companies can’t agree with that. Functionality and versatility are the great strengths, but 2018 Pacifica is an innovative and modern minivan. While all other companies are still developing their hybrid drivetrains, 2017 year edition of Chrysler’s van is available as a plug-in. However, in this segment, there is always room for improvements, especially when there is tough competition. Under the hood of the 2018 Toyota Sienna is a 3.5-l V-6 engine paired with an 8-speed gearbox. Front wheels are receiving almost 300 horses. On the other hand, 2018 Chrysler Pacifica makes 260 hp from a 3.6-l Atkinson V-6 powertrain. The engine is also capable to deliver 235 hp. So, an advantage in power output is obviously on Sienna’s side. Another advantage is an all-wheel drive. Unfortunately, Pacifica doesn’t have AWD configuration available for 2018 season. This makes Toyota’s minivan more versatile, maneuverable, and SUV-like. When we compare MPG rating, numbers are telling everything. 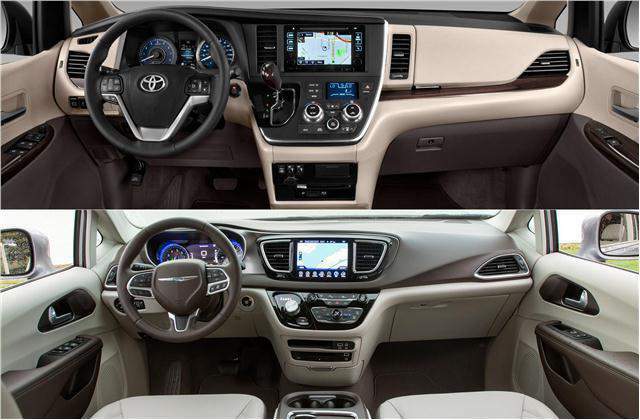 Toyota Sienna will improve its efficiency for the upcoming model. It can offer 20/27 mpg. The 2018 Chrysler Pacifica can do the same combined mileage, with one mile better fuel economy on the highway. However, it goes less in urban condition also for one mile. But, these are numbers for petrol units. Here Pacifica Hybrid jumps in and dominates. Only with electric batteries minivan can go 33 miles. Combined with a conventional drivetrain, estimated fuel consumption is 32 mpg. Finally, the mpg-e rating is at 84. So, if power is 2018 Toyota Sienna’s strength, then Pacifica ties the result with fuel economy. 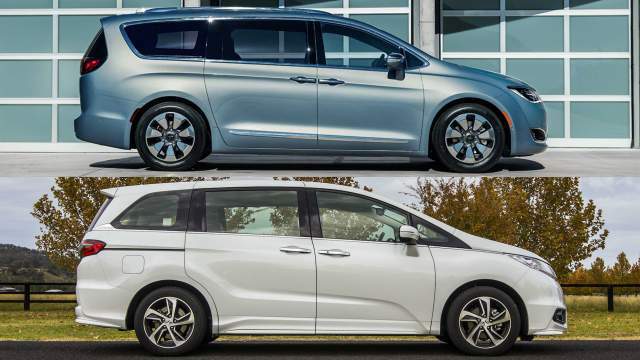 Trim levels of both 2018 Toyota Sienna and 2018 Chrysler Pacifica are offering pretty much the same. For example, base models’ seats, door panels, and other parts are covered with cloth. Higher-end trims have leather and other premium materials. Furthermore, capacity for 8 passengers is also in common. While the top Sienna model, Limited Edition Premium, is coming with a lot of luxurious features, equipment on the base vehicle is aging. Travelers will have more room in 2018 Pacifica, thanks to the better layout. Also, the cabin is much quieter than for Sienna. So, Chrysler’s minivan wins the battle in overall comfort. Another area where numbers are the key factor. The 2018 Chrysler Pacifica can tow up to 3,600 pounds. Although Toyota Sienna for 2018 offers 100 pounds less, we can consider this as equal. The downside of hybrid is that is not predicted for towing. Both vans are offering similar space for cargo. Foldable third-row seats can provide more room. However, that means tighter second row and less comfort. This is where Sienna offers slightly more space, especially in higher trim levels. Nevertheless, Hybrid Pacifica is not too bad either. The safety is probably the most important for minivans. Power, interior room, and equipment, or fuel economy are the things we are looking for, but responsibility for 8 occupants is a top priority. The modern design of the 2018 Chrysler Pacifica puts this van in advantage. 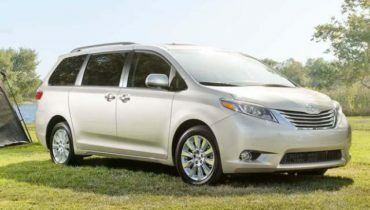 Recently, this model received top ratings for crash safety, while Sienna is not at the top in this segment. However, lack of safety features is noticeable in both models. Packages are available from higher trims. 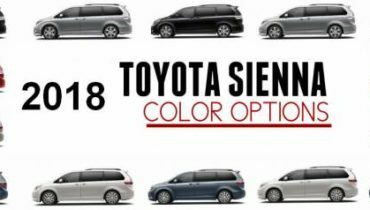 Owners of 2018 Toyota Sienna can purchase option package for $1,800, while buyers of Chrysler’s minivan can add SafetyTec package for $1,000. Advanced version costs $2,000 and there is lane keep assist and automatic parking features among others. We can say that $1,000 gap is not making a big difference. But, for that money, you can improve whatever you want on your minivan, and make it better than a competitor. So, this is definitely another advantage of the 2018 Chrysler Pacifica. Its cost of $29,000 for the base model is better than $30,000 for entry-level 2018 Toyota Sienna. The most expensive versions of both vans cost around $50,000. 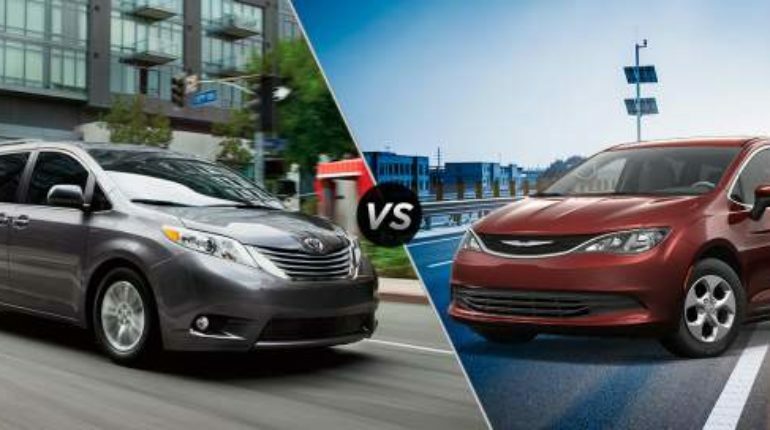 Warranties are the same both for Toyota Sienna and Chrysler Pacifica. The basic one is 3-yr/36,000-mile, with warranty for the engine on 5-year/60,000-mile. The worth of mention is a 10-year/100,000-mile warranty of the new Kia Sedona that is the best in the class. Parts and maintenance are cheaper for Toyota’s products, and this is another important detail that can be decisive. After the review, the situation is everything but clear. Which minivan is better depends on buyers’ priorities? If you are looking for a safe and modern vehicle, 2018 Chrysler Pacifica is the right pick. Also, its hybrid dominates in fuel economy range in the entire minivan segment. However, 2018 Dodge Grand Caravan and 2018 Toyota Sienna will both bring a plug-in model for next season, and this advantage is not going to be so huge. On the other hand, when buyers want versatile minivan which can be turned into towing machine, Sienna is a better choice thanks to AWD and versatile interior layout.